The role playing game genre has never been more popular than it is right now. The Elder Scrolls V: Skyrim has sold 10 million copies. Mass Effect 3 is coming out in March. Those two series are arguably the two most popular RPG franchises ever made. 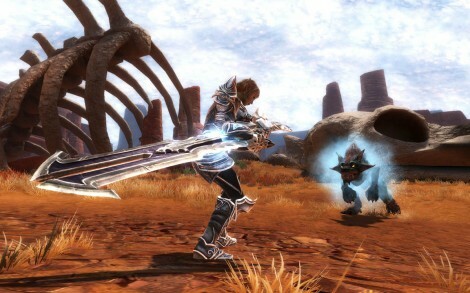 It’s going to be hard to find a place among giants, but Kingdoms of Amalur: Reckoning hopes to do just that. With what started out at Big Huge Games as Project Mercury, 38 Studios stepped in to acquire the studio when THQ was looking to close the development house. Already working on their secret MMORPG codenamed Copernicus, Mercury was transformed to fit into the same world as the MMORPG and thus was born Reckoning. Produced by Ken Rolston (a former Bethesda employee who worked on The Elder Scrolls games), with a story by R. A. Salvatore and art by Todd McFarlane, Reckoning is backed by some big names, though names don’t always translate to good games. I tried the time-controlled demo to find out if it was worth buying when the full game is released on February 7th. If you are tired of the gray and brown graphics of many RPG’s these days, you will be pleasantly surprised by the lush beautiful environmental design of Reckoning. Whereas more recent RPG’s have tended to be more realistic in appearance, this game opts for a more exaggerated style. It’s more in tune with the Fable franchise than, say, The Elder Scrolls or Dragon Age. It also is very similar to Fable in the way it handles combat, though Reckoning is fun and engaging where Fable was boring and methodical. The combat is very action RPG oriented and if you time the strikes right you can juggle enemies. Yeah that’s right. I said juggle, and I don’t mean an RPG mini-game where you have to keep 3 balls, knives, or bowling pins in the air. I’m talking about fighting game type of juggling. It’s weird to see it in an RPG but very cool at the same time. As you kill enemies, the fate meter fills up. Without getting too much into the story, there is a reason why you have this meter. The more enemies you kill at a time, the higher your combination rises the faster your fate meter will fill. Once it is all the way full you can unlock the reckoning mode. When in the reckoning, your character moves faster and has a quicker reaction time. This is how you rip the fate from a fallen enemy. To do that requires a simple button press which enters you into a God of War like QTE to see how much experience you can rack up as you kill the enemy. As you rip the fate from that singular enemy, most other enemies in the vicinity are also killed. It’s a neat little addition that doesn’t seem to be overused. The meter doesn’t fill up that quickly so it doesn’t seem like you can abuse the mode. There are three classes of characters you are able to choose from. Staples of the RPG fantasy genre, you can choose from warrior, rogue, and mage. Where Reckoning gets intriguing is that you can use the talent trees of Might, Finesse, and Sorcery to come up with your own unique combinations for your character. Called the Destiny system, you can hone your character to become a sneaky mage who can either electrocute enemies from a distance or sneak up behind them to slice and dice them with your daggers. Once you progress in the game, the investment you make in the talent trees will pay off in the form of special abilities corresponding to your particular play style. It is an interesting change of pace for a typical and tired RPG character framework. Throughout the demo I did encounter a few glitches. When I play any game, I turn on the captions. It helps me better understand the overall story. In Reckoning, I found that often the captions wouldn’t appear or would be so far behind what was being said that it was better not to have them. Howeve,r the most frequent glitch I encountered was disappearing textures. As I walked through a field, the ground lost all of its texture and became a flat gray polygon. These types of things are to be expected in demos, so be aware. For those of you who aren’t interested in Reckoning and are salivating in anticipation of Mass Effect 3, there are some special unlocks you’ll receive if you play the demo. Just starting the demo will get you everything but the Omniblade daggers which will only unlock if you play through to the end. The whole demo lasts around an hour and a half if you get through the opening tutorial quickly. After the tutorial you get 45 minutes to roam around and complete quests as you wish. 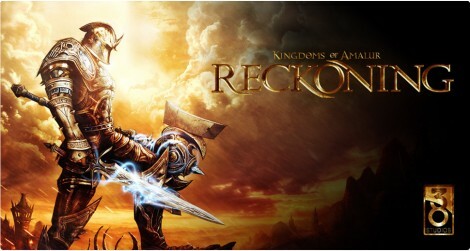 Kingdoms of Amalur: Reckoning will constantly get compared to Fable and Skyrim and those comparisons are completely warranted. The fighting and graphical style invoke that of Fable. Everything else will remind you of Skyrim, but that isn’t a negative mark by any means. Reckoning is less intimidating than Skyrim might be to some people and plays like everyone thought Fable ought to. I had a lot of fun with the demo and it left me thinking that this game is what I’ve been waiting for. The Bethesda games have always been to daunting for me, and Fable just got boring very quickly. Reckoning seems to be that happy medium between the two and I, for one, can’t wait until February 7th. Wow great demo impression. First I’d like to say that when I explain this game to people I compared it exactly as you did. I always wanted to play a sequel to the original fable and instead i got Fable 2 and Fable 3 both crap and more crap KOA Reckoning is my Fable 2 or at least what it should have been and I’ve been waiting for about 6 years for this game. Aside from the graphical glitches which I really hope are are addressed, this demo exemplifies how the game will be perfectly and is already my GOTY for 2012. I’ve played the demo about 8 times now and I can’t get enough. Fable was boring and Skyrim was,… well boring also, way too dark of a graphical pallette and not a deep combat system at all still a great addicting game but not what I was looking for. I find myself staring at the calendar screaming why isn’t it feb 7th yet.